As an intern on Dr. DeBakey’s service, I had to know every (and I mean every) detail on every one of his patients. Lateral chest radiographs were put up for him to review with the spine to the right. There were two pencils put out next to his list for morning report, one red (on the left) and one black (on the right). The intern even made the coffee (decaf on the top burner, regular on the lower burner). It’s hard to describe the stress of the service… or how much I learned. But the real reason for this post today is one of the other things that routinely happened on morning rounds. At the end of grilling the residents, consultants, and anyone else who happened to be there, Dr. DeBakey would often turn to an intern and ask them if they had a favorite poem. Dr. DeBakey treasured education and truly loved great writing and poetry. It’s fitting that Baylor College of Medicine has honored him with a medical student poetry contest. The following is copied from this url from news 92 FM in Houston. Baylor College of Medicine announces the Tenth Annual Michael E. DeBakey Medical Student Poetry Award. This annual contest honors the pre-eminent cardiovascular surgeon, pioneering medical scientist, gifted medical educator, prolific author and scholar, and passionate advocate of optimal healthcare throughout the world. 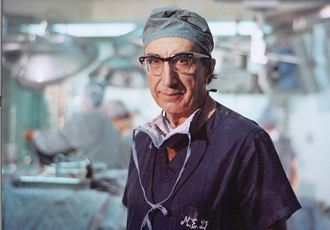 Dr. Michael E. DeBakey has long advocated a role for the humanities in medical education and in the development of a full, enriching intellectual life. 2. By a copy of the student photograph I.D. card, entrants must document enrollment in an accredited American medical school in pursuit of the M.D. degree. 3. Each medical student may submit only one poem, not to exceed 2 pages. 4. Entries must be postmarked no later than December 31, 2012. Original, not published or under consideration for publication, and not having previously received a poetry award. Limited to 2 pages, double-spaced. In English; no translations from other languages. Printed on 8.5 x 11 inch bond paper. Current mailing and e-mail addresses, telephone, and fax numbers if available. Copy of photographed student I.D. card documenting medical school enrollment. Submitted in five hard (print) copies, as well as one compact disk (CD) in Microsoft Word (not DVD or floppy diskette). 9. Winners will be announced on July 1, 2013. 10. The first-prize poem will become the property of the Michael E. DeBakey Medical Student Poetry Award program and will be submitted to a major medical periodical for consideration for publication. If it is accepted for publication, the publisher will own copyright. David H. Berger, M.D., M.H.C.M.